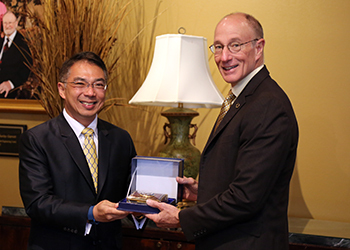 In a ceremony among top university administrators, LU President Kenneth Evans and Pornphisud Mongkhonvanit, president of Bangkok, Thailand-based Siam Technology College, signed a Memorandum of Understanding to further collaboration for shared academic programs with the intention of offering dual degree programs in digital learning and leading, business, and other academic subjects. Both have committed to explore unique programs that serve the needs of professionals globally. These dual-continent programs are designed with the future in mind as they link the rapidly growing economies of Asia that represent more than half of the world's population to the established influence of the United States and Lamar University. LU’s Master of Education in Digital Learning and Leading is designed to prepare education practitioners from different educational jurisdictions and from all levels to lead digital learning programs, integrate digital resources, and design, develop, and research effective digital learning environments. This program emphasizes educational improvement through advanced pedagogy and principles of educational change management and allows students to customize the program for their unique needs. This program is also designed to lead to a “dual degree” award that offers students the ability earn a U.S. degree from Lamar University and at the same time, earn a Thai degree from Siam Technology College. Beyond the dual degree award, students would also obtain industry certification from Microsoft and additional academic certification from Lamar University. Through existing relationships between Lamar University and Microsoft Inc., all students who complete Microsoft’s Teaching with Technology professional development course and pass the Microsoft Certified Educator (MCE) exam, will be granted the Microsoft Certified Educator credential awarded by Microsoft. The widely respected Microsoft Certified Educator (MCE) certification provides focus in six content areas, each mapped to the UNESCO ICT Competency Framework for Teachers, Technology Literacy: education policy, curriculum and assessment, pedagogy, ICT/technology tools, organization and administration, and professional development. In addition to the professional certification from Microsoft, Lamar University will recognize any teacher in this program as a Certified Digital Educator with the issuance of an academic certificate on the way to the Master of Education in Digital Learning and Leading degree. 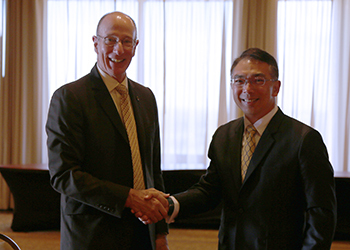 Lamar University and Siam Technology have also agreed to work toward a dual undergraduate degree with a focus on International Business and Intercultural Leadership. Students who successfully complete this dual-degree program would be awarded a baccalaureate degree in International Business Management from Siam Technology College and a baccalaureate degree in Intercultural Leadership with a minor in business management from Lamar University. This program is designed to prepare students to immediate apply for acceptance into the AACSB accredited Masters of Business Administration (MBA) program at Lamar University with no additional leveling work required. Students who are accepted into the MBA can choose a concentration in one of six areas: enterprise resource planning, experiential business and entrepreneurship, service marketing and management, financial management, healthcare administration, or leadership and organizational management. Lamar University and Siam Technology College are have also committed to exploring ways to make these dual-degree programs affordable and accessible to all. By accepting credits transferred from Siam Technology College, these degree programs are available at a lower cost that if all courses were completed on the Lamar University campus. Additionally, by offering courses in both Asia and North America, students would have the flexibility of studying where they choose while still obtaining a Thai degree and U.S. degree. Lamar University is a doctoral research university, a member of the Texas State University System, and has 15,000 students. The Southern Association of Colleges and Schools accredits the university. The National Council for Accreditation of Teacher Education accredits teacher preparation and education graduate programs in the College of Education and Human Development. Lamar is among the largest educators of teachers in the United States through its nationally recognized online Masters-level education programs. 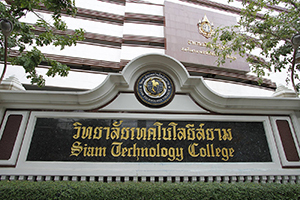 Siam Technology College, founded in 1965 as Thailand’s first Technology College under the name Siam Institute of Technology, and the first private technology college in Thailand, is a private education institution under the Office of the Higher Education Commission in Thailand. With more than 10,000 students, STC is also one of the fastest growing institutes of higher education in Thailand.